You can now easily explore the ocean depths with this affordable submarine. When it comes to outdoor recreation, there’s plenty of devices and drones out there which let you capture the action on land. That being said there hasn’t been much in the way for underwater explorations. Gladius is a submersible underwater drone designed for scuba divers, underwater photographers, commercial divers, oceanographers, and anyone who wants to have fun. 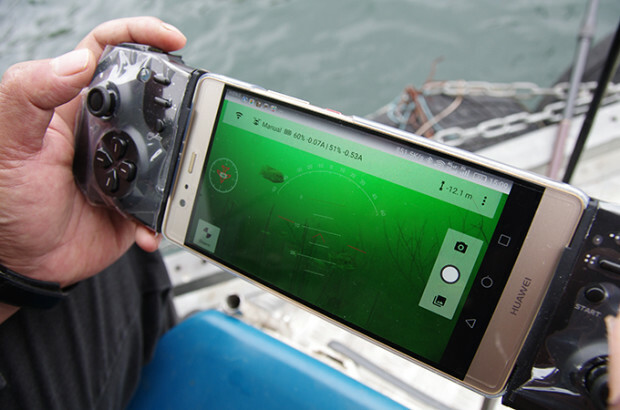 The device is equipped with low light sensors and image quality algorithms to deliver distortion free imagery at depths of 100 meters. To make it easier to control the device, Gladius is equipped with a unique quad thruster design which allows responsive and accurate navigation in all directions including left/right, forward/back, rise/fall, and roll. The motors make it possible for the device to go forwards or backward at speeds of 2 meters, or 6.6 feet per second, or at four knots. One of the most notable elements of Gladius is the video game like simple controls of the device. To control the drone, users only need to add their iOS or Android smartphone to the remote control, and they’re good to go. The controller uses two joysticks for the primary directional movement – one for forward, back, and turning, while the other controls the camera positioning. The drone is capable of diving up to 100 meters (328ft) deep with a horizontal range of 500 meters (1,640ft). It’s able to be submerged for three hours enabling users to capture video to internal storage or it can be streamed live via social media. The internal cabin of Gladius is sealed and uses aluminum alloy materials with oxidation treatment to ensure the drone is waterproof and corrosion resistant. This enables it to dive to the previously mentioned depths. The batteries have a run time of 3.5 hours while requiring only 1.5 hours to recharge. In order to deliver longer ranges, Gladius features a unique semi-tether connection system which allows the device to communicate with the towable buoy by direct wiring. The tether connects to a towable floating buoy which wirelessly connects to the user’s smartphones via long range Wi-Fi communication. 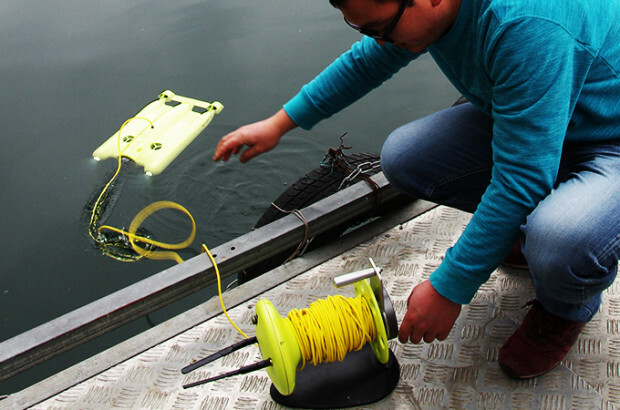 The integrated wireless module within the buoy has a range of up to 30m (98ft) for the standard model and 500m (1,640ft) for the advanced model. Gladius features 1080P and 4K capabilities to deliver stunning underwater photo and video. There also are adjustable dimming LED headlights (1200 lumens) which have a 135-degree illumination angle to light a clear path for the drone and underwater subjects. So far, the makers of Gladius have raised over $277,000 over their crowdfunding goal of $30,000 with an estimated shipping date of July 2017. Pricing for the device starts at $625 which is $775 off the suggested retail price. Each purchase of the standard edition includes a: smartphone remote controller, 1080p HD camera, 16 GB SD card, 30M tether, and a wireless body.